The reason you have trouble losing weight -- especially fat -- is because you're not eating like our warrior ancestors did, says Ori Hokmekler, creator of the Warrior diet. According to Hofmekler, that includes consuming the bulk of your daily calories in a four-hour "overeating" phase in the evening while semi-fasting during the other 20 hours of the day. Followers of the plan are instructed to avoid processed products in favor of whole, natural foods. Although there is some scientific evidence to support the idea that consuming most of your calories per day in one big meal aids with weight loss, including one study published in 2007 in the "American Journal of Clinical Nutrition," more research is needed. Talk to your doctor before starting the Warrior diet. You'll eat mainly fresh fruits and vegetables and leafy green salads during the day. They'll also be the first foods you eat during the evening overeating phase. In the daytime, enjoy them raw or juiced; steam them for your large nighttime meal. Your best choices include berries, grapefruit, peaches, mangoes, melons, bananas, peeled apples, salad greens, tomatoes, onions, carrots, mushrooms and cruciferous vegetables like cabbage and Brussels sprouts. On a typical day, you might have a piece of whole fruit at breakfast, carrot juice as a midmorning snack, salad for lunch, fruit for your afternoon snack and salad with plenty of vegetables at dinner. Warrior diet salads should be dressed, if desired, with an olive oil vinaigrette prepared with any type of vinegar other than white vinegar, says Hofmekler. Beans, legumes, nuts -- walnuts, pistachios, raw almonds and pecans -- skinless chicken or turkey, lean cuts of beef or pork, white fish such as snapper or sole and eggs, poached or hard-boiled, are the recommended protein choices on the Warrior diet. Look for organic, hormone-free meats whenever possible. 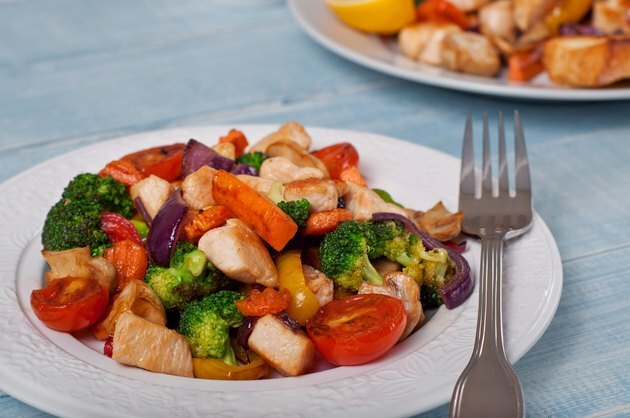 Arrange your meals so that you consume a protein-rich food only after you've eaten a salad and vegetables. Other than nuts and eggs, you're instructed to consume high-protein items exclusively at night and to rotate your choices each day. Choose organic dairy products such as plain, unsweetened yogurt, kefir, cottage cheese and other types of cheeses like ricotta, goat, Parmesan or feta. Although the U.S. Department of Agriculture advises consuming only low- or nonfat dairy, Hofmekler does not make this distinction. On the Warrior diet, you'll eat dairy most often as a midmorning or afternoon snack, though you may have it during dinner on days when your protein source is fish or eggs. Hofmekler says you should only eat carbohydrates after you've finished eating salad, vegetables and protein, and only if you're still more hungry than thirsty. Quinoa, barley and rice -- both wild and brown -- are best, but you're allowed oats, pasta and bread after the diet's third week. Starchy vegetables like potatoes, peas, winter squash such as butternut squash, sweet potatoes and corn are also counted as a serving of carbohydrates. Try to limit yourself to only one main carbohydrate food in your dinners. Sugar and sweets aren't allowed, though you can have sugar-free gelatin as a treat later in the diet and may sweeten foods or beverages with Splenda. While you're on the Warrior diet, you're advised to consume a variety of special diet products marketed by Hofmekler. These include Warrior Milk, Warrior Bars and dietary supplements known as Warrior Diet Essentials and Warrior Diet Stubborn Fat Burner. Primrose oil, flaxseed oil, brewer's yeast, vitamin C and probiotics are other recommended daily supplements.